CHIKARA Season 15 has all been building to this! The Epic Conclusion of Season 15! For the 1st time ever, the Grand Championship of CHIKARA will be defended in a Triple Threat match! Reigning champ Hallowicked will face the 2 previous champions in Philadelphia at “Top Banana.” Our inaugural championEddie Kingston is cashing in, but so too is the man Hallowicked defeated for the title – Icarus. The historical significance of this match can’t be overstated…these 3 men are the remaining Gen-1 originals still active in CHIKARA! The season-long “Challenge of the Immortals” round-robin has seen 90 matches hit the history books, and the finals are taking place on December 5th! The two top point-getters are on a collision course, as Princess KimberLee, Jervis Cottonbelly and Los Ice Creams (“Crown And Court”) are set to face The Wrecking Crew! Can the ultimate underdogs overcome the quartet that has dominated CHIKARA for the past 2 years? Will the Season 15 Finale see the ultimate collapse of The Colony? Fire Ant is set to go one-on-one with Soldier Ant for the first-time, ever! Since his return last season, Soldier Ant has been an unstoppable force for destruction, and thus far, former friends and partners have seen no mercy when facing him. 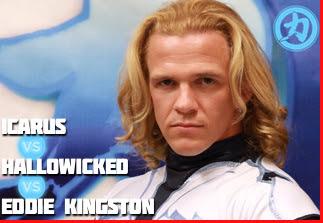 Will Fire Ant be his next victim? Tickets to our Philly event are available online right now! Live at the former ECW Arena/now 2300 Arena!